The club has demonstrated fantastic spirit, and has gone from strength to strength in the last number of years. 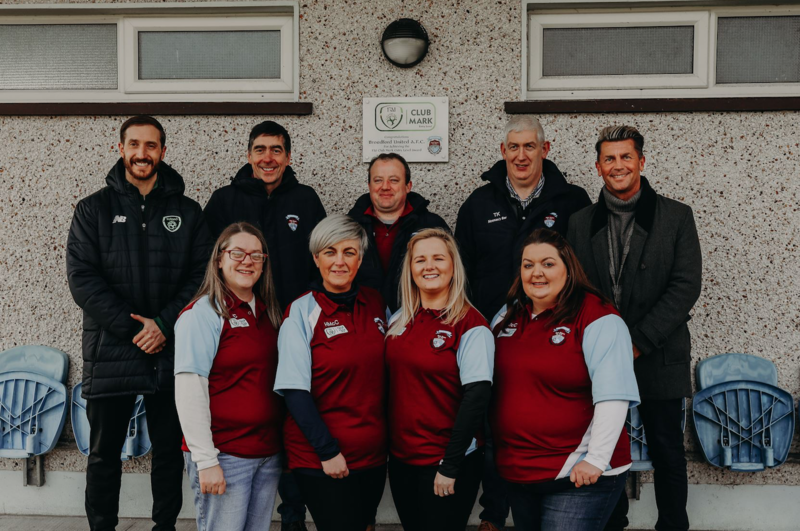 In 2018, the club was a finalist for the FAI Club of the Year competition and are now also one of the fastest clubs in the country to earn complete Club Mark criteria. Colin Bell, Ireland's Senior International Women’s Manager was on hand to unveil the new plaque. Colin was also available to present women’s team with their medals for winning the league. The majority of the team are with the club since they are 12 and were the first female team in the club. Club PRO Joan Croke also received an award for services to the club. Broadford United work closely with their local Development Officer Barry McGann. Barry continues to work with the club to assist them along their path, and has been delighted with their progress. The FAI Club Mark is an Award for grassroots clubs based on how well the club is managed off the pitch. The journey challenges clubs to implement policies and procedures in line with best practice. If your club is interested in attaining the award or finding out more please complete this short*registration form. Broadford United FC were recently presented with their official FAI Club Mark Entry Level Award.